Living room, dining area, kitchen and 1 bathroom. 2 double bedrooms, 1 twin bedroom and 1 bathroom. Above the first floor is an open plan mezzanine where there is a further single bedroom. Private pool, pergola, dining table, barbecue and sun loungers. The living room has sofas, WiFi Internet, DVD player, dining area and ornamental fire place. There are patio doors to the pool terrace. The kitchen features: full oven, cooking hob, fridge/freezer, microwave, washing machine and kettle. There is also a Barbecue. Bedroom 4 is air conditioned with 1 single bed. Ekklisies Tria can sleep up to 7 people. Your own private pool, shaded dining area and full size barbecue, all set in lawned gardens. You will never want to leave this fantastic villa! Next to the shaded dining area is a barbecue. We had an enjoyable holiday in a very good villa. Everything was clean and tidy and we particularly appreciated the change of linen etc, the air-con and a "proper swimming pool", not a paddling pool. I have been impressed with Agni Travel; the web site is easy to use and helpful. We have just returned from a family holiday staying in this lovely villa. I particularly liked the setting with the views of the mountains. The villa was spotlessly clean when we arrived and had everything you need. The cleaner was lovely and provided us with extra blankets and extra sets of clean towels. The location is ideal as within a short walk are good tavernas and local shops. The setting is peaceful surrounded by olive trees and those wonderful mountain views. The swimming pool was very clean just a little cold for us as it was October when we left. Chania, Rethimon, the airport are all within an hours drive. We enjoyed walks from the house and many walks in the mountains. Particularly recommend the botanical gardens for their terrace and the views of the mountains. My family recommended the nearby beaches particularly at Georgopolis. A fantastic house with a Great pool. We will come back. Just returned from two fantastic weeks in Ekklisies tria . Pool was wonderful and our teenage children spent many happy hours lounging and swimming. The villa fitted the description on the website perfectly and was lovely. The gardens and grounds are also beautiful. The village location was handy with a local tavena bar and two mini markets. The villa was a fantastic base to visit some of the local area but also to chill out barbecue and relax. 5 stars to Agni travel and the owner for a very enjoyable holiday. We had a fantastic holiday in Crete as usual and the villa was wonderful. It was large enough for the four adults and we spent a lot of time in the pool. The pool was huge and deep but this means its not for those who like to touch the bottom and dont swim well - for those who do swim however it is fantastic. The villa was easy enough to find but we did know the town next door quite well. Having a door from the bathroom to garden was excellent as we could walk straight in and shower without getting water all over the house. Our key stopped working the electric whilst we were there and Agni Travel sent someone to replace it within 15 minutes. Excellent service, thanks. We had a fabulous time in this well equipped villa. In a great location not overlooked the villa and pool were superb. The maid service changed bedding and provided fresh towels every few days which was excellent. Would not hesitate to recommend the villa and Agni Travel. Enjoyable stay at this well-equipped villa. Lovely views of the mountains and good location on the edge of the village. Excellent taverna within easy walking distance others are a few kilometers away in Vamos or in Georgiopolis. Cleaning was efficient. Good support from Agni Travel. 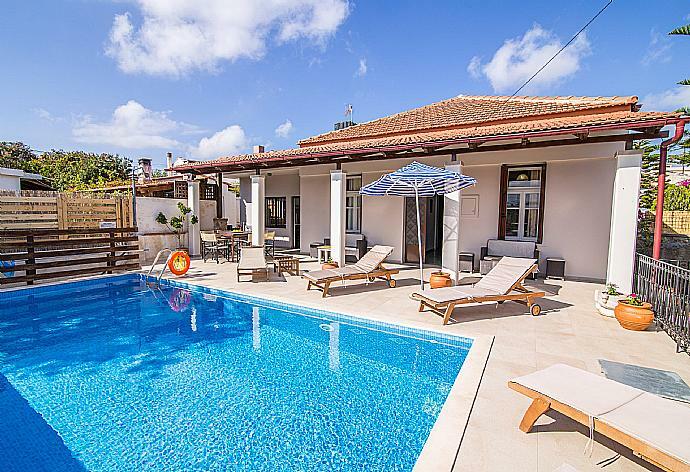 This villa would be ideal for a couple a family or maybe two couples.The pool doesnt have a shallow end and is quite deep (minimum 1.75 m) so this might be of concern to families with small children. Plenty of places to visit within easy reach by car so a good all-round place to stay. Agni Team were responsive when we had queries or problems during our stay. These issues were dealt with quickly. Lovely villa in a Lovely location. Comfortable and lots of great outside space. Gardens are beautiful and well maintained. The taverna in Kefalas is a real gem. Would definitely recommend the villa and Agni Travel to others. 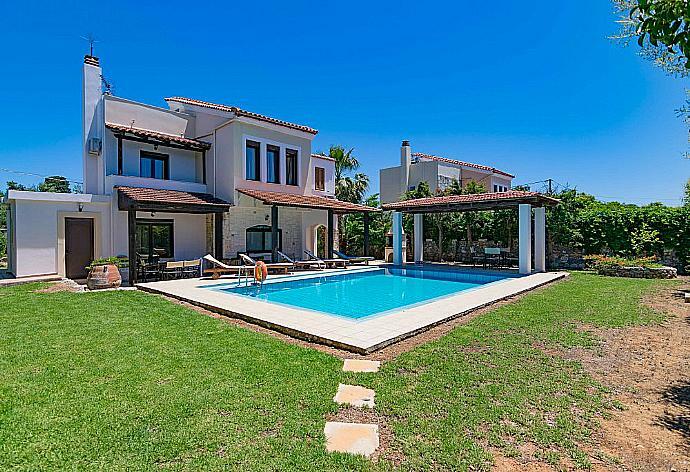 Great villa in a lovely location. Everything was just perfect. We loved the villa and the little village Kefalas. Villa and pool were very clean and included everything we needed. This was the first time we used Agni Travel but definitely not last. We loved the fact that we were the only finnish people in the village ) I can warmly recommend the property and the Agni Team. Very pretty villa and exceeded our expectations. It was clean and tidy, well equipped with kitchen utensils. The enclosed mature gardens were lovely. Though next to a road it had very little traffic so made for a peaceful and relaxing holiday. Nice clean villa and pool. Remote location so peaceful. All arrangements were easy to make with Agni Travel. Kefalas is a traditional 800 year old village with a large number of historic buildings from Venetian and other times, some beautifully restored, others in ruins. 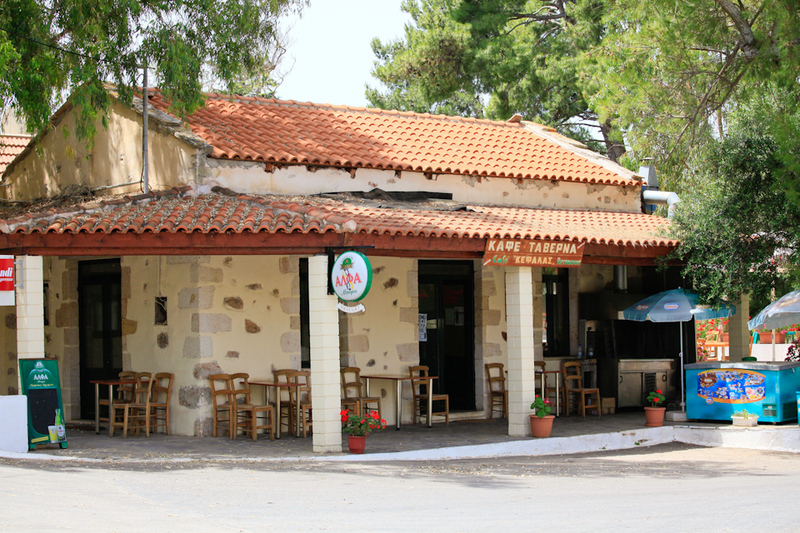 It is quiet village with a 'Platia', shaded by beautiful old trees, a couple of tavernas and two supermarkets. The supermarkets are small, but with all the essentials - one of them sells bio-organic food and vegetables. Locals say that there nearly 30 churches in the village, most of which are from the time of the Turkish occupation, when land would not be confiscated by the Turkish rulers if there was a church on its grounds!